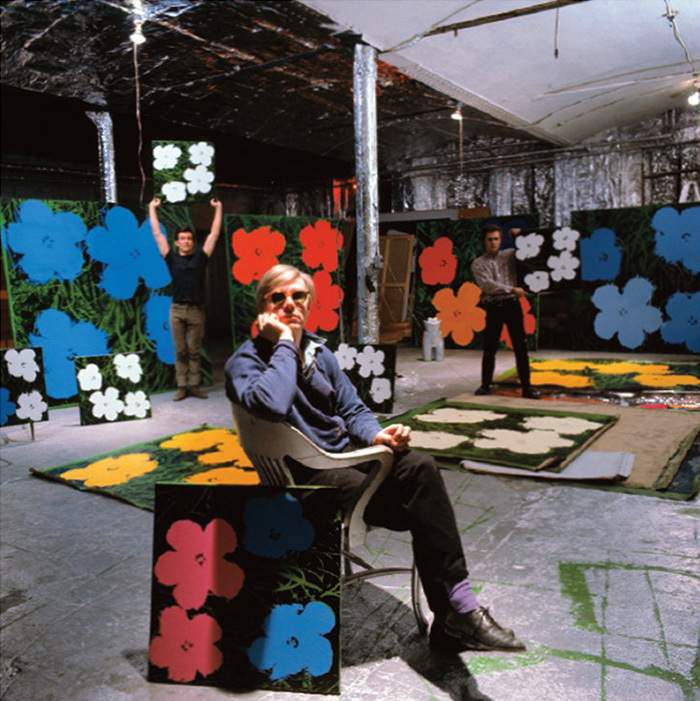 Flowers was Andy Warhol’s first major public show with Leo Castelli in New York, Fall of 1964. They were a series of square canvas reproductions with no fixed upright allowing freedom for orientation of the artworks, singularly and as a series. Andy also explored new techniques and media including screen-printing, pencil, hand painted acrylics, color-blocking and fluorescent paint. 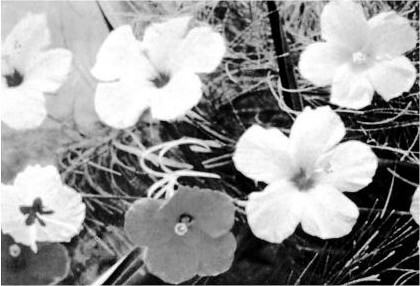 The Flowers were based on a colored photo of hibiscus blossoms taken by Patricia Caulfield, found in the June 1964 issue of “Modern Photography” with an article on Kodak color processors (see images below). Caulfield sued Warhol for using these images. He offered her two sets of Flowers but was declined and a cash settlement was made. And just like that, Andy took that picture (two-page foldout) and used it. Cropping it into a square, the original seven flowers became four, and he cut, rotated and replaced a flower to fit (see acetate mechanical above) and began color-blocking each blossom. Composed without a horizon or foreground, the flowers hover over the dark foreboding background abyss of black and green grass. Between June and July 1964, his “Factory” became an assembly line dedicated to the fabrication of Flowers. 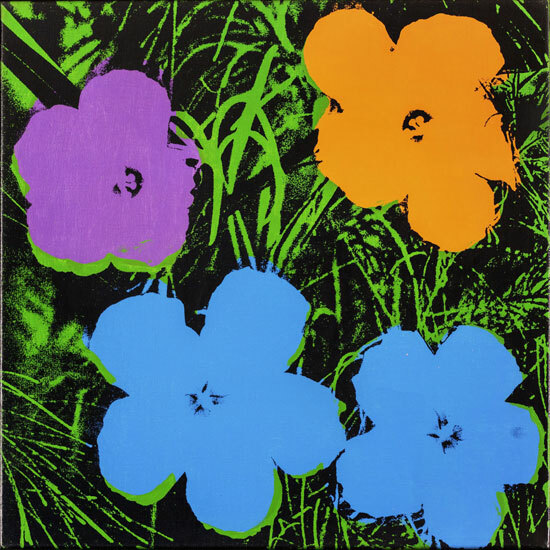 With his modern execution of silkscreen printing, Warhol was able to remove himself somewhat from the artistic process (be more a machine), and rendered his Flowers as mass-produced and manufactured. 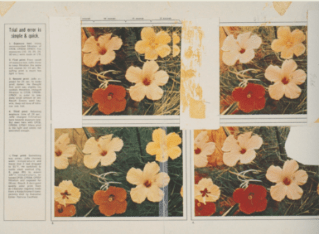 While Warhol did the Large Flowers paintings himself, he employed a legion of assistants to manufacture 900 smaller Flowers, finishing up to 80 a day (various sizes, colors and arrangements). Friends come over to the Factory and do the work with me. Repeating the same flowers with different colors and treatments, the singles became gardens. For the Leo Castelli show he filled the entire room with these decorative blooms. There was beauty everywhere and people were intrigued with the repetition and pattern. That once unremarkable photo became an iconic series of paintings, Dealer Ivan Karp recalls. The show was a complete success with every painting sold. Andy had painted flowers before (above) but this series was far more abstract. These happy childlike bright flowers gave an initial impression that he had left behind his deep obsession of death with his repeated gruesome depictions from previous exhibitions, but when you peered past the flat, motif Day-Glo blossoms, you found a consuming blackness still percolating there within the grass, a ripple echoing within the subconscious. The flash of beauty that suddenly becomes tragic under the viewer’s gaze. The garish and brilliantly colored flowers always gravitate toward the surrounding blackness and finally end up in a sea of morbidity. No matter how much one wishes these flowers to remain beautiful they perish under one’s gaze, as if haunted by death. — J. Coplans, *Andy Warhol: The Art. exhibition catalog, Pasadena Art Museum (1970:52). Taking on an age-old tradition of still-life flowers, Andy aligned himself with the likes of Monet, Van Gogh, Matisse and Picasso. David Bourbon described Flowers as “cut-out gouaches by Matisse set adrift on Monet’s lily pond”. With Flowers, Andy was just trying a different subject matter. In a funny way, he was kind of repeating the history of art. It was like, now we’re doing my Flower period! Like Monet’s water lilies, Van Gogh’s flowers, the genre. 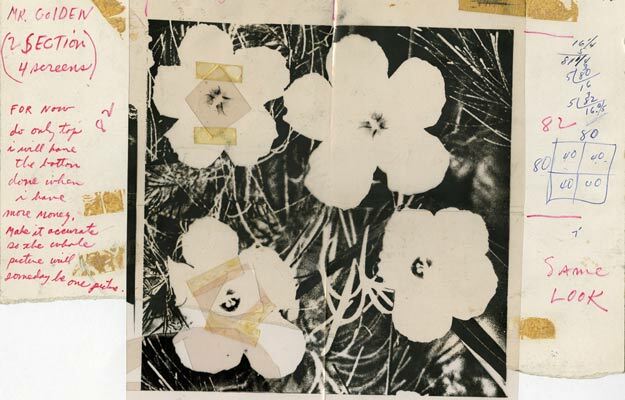 He then manipulated his blooms, transforming them, Waholing them, abstracting their form, simplifying, multiplying and with the revolutionary art of silk-screening and replication, made them his. Personally I found myself interpreting the flowers as Andy Warhol’s friends. As single painting or a garden, the flowers showed grouping that could symbolize Andy’s parties, groups, loners, individuals, and of himself. He loved people and surrounded himself with them, but he always remained aloof. Yet, they were his flowers, his happiness, his joy. That smaller flower (purple in this painting), he rotated and placed, appears separated like Andy. I think thats how he felt being so shy but really he was the bigger flower (the orange one), with the other grouped around him like a moth to a flame. His light (the flowers/friends) stopped him falling into the darkness (the background). By the way I never got to say why I chose this artwork … well it was more a series since they were all glorious. I appreciate and am inspired by artists that can simplify their work. I’m a clutterbug inside and out and I’m forever wrestling with the over-complication of everything and unnecessary garbage. (This fact is presented here shown that with more time on my hands I redid and expanded my submission with pictures after the deadline was extended lol – for those of you that saw the first copy). Anyways, I love all of Andy Warhol’s work, each in it’s own unique way, but I chose Flowers because of its childlike simplicity and uncomplicated design. Yet it still has a story and deepness behind it. It just reaffirms with me that art is about “creativity” and the idea and concept, not always about how skillful you are with a pencil or a brush. I just like elegant simple graphic things. They just seem much more “clever” than even the most amazing paintings that catch your breathe. I like that. And thats what I like most about Andy Warhol.